It's getting to that time of year again, when gardens are closed and the weather is bleak and blustery! I've been writing this blog for 18 months and have visited many wonderful gardens, so it's time to look back and reflect at some of those I've really enjoyed, while making plans for 2011. 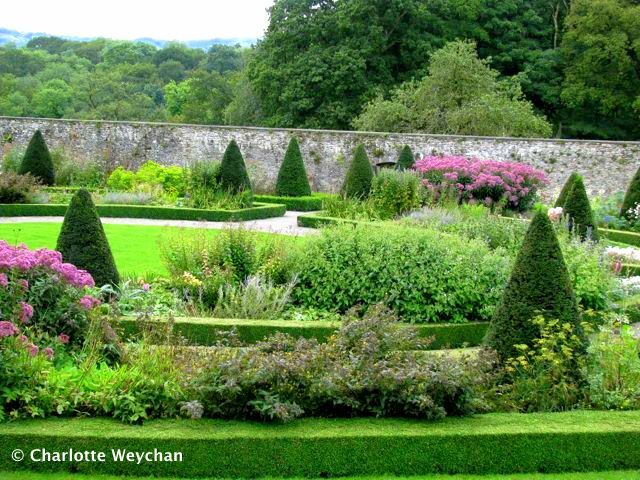 One of my all-time favourites is Aberglasney in Wales (above) - which has been lovingly restored over the last 15 years. The house and garden have a long and varied history, with a cloister garden dating back to Tudor times, but it is the remarkable restoration work that makes this garden worth visiting. An Cala in Scotland - a 1930's plantsman's garden, where much of the original planting still survives - looks glorious in the fall, and I have happy memories of my visit there two years ago, on a blustery autumn day. Located near enough to Arduaine, Ardkinglass and Ardtornish to make a real day out. The garden is located on a hillside and is filled with streams and waterfalls and has fine views. I must get there in spring because I'm told the azaleas, rhododendrons and cherry trees are stunning! I visited Ascott (above) for the first time this year. It's definitely a garden on a grand scale, spreading out over 30 acres. 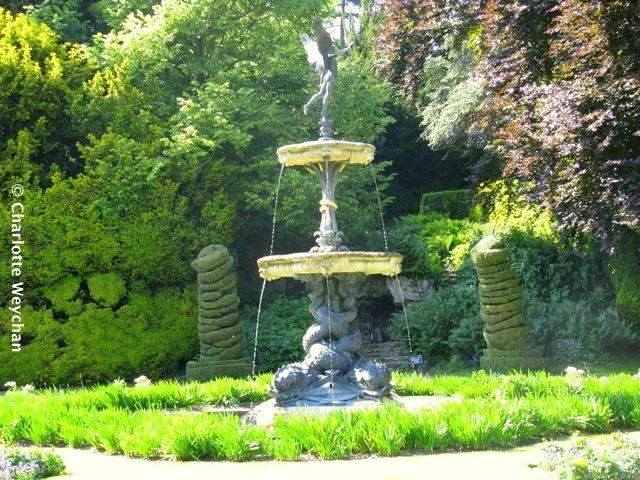 Notable for its magnificent views over the Vale of Aylesbury and it's impressive fountains designed by American art historian and critic, Thomas Waldo Story, you certainly won't forget the topiary here either! It's been on my wish list for several years and I'm glad I made it this summer - it was worth the effort and ranks as one of the great gardens to see here in Britain. Athelhampton is always a joy, with its many nooks and crannies. Designed by Francis Inigo Thomas, this Arts and Crafts garden surrounds one of the finest 15th century manor houses in Britain. Located in the heart of some of the best countryside in Britain, close to the Jurassic Coast, and rolling Thomas Hardy country, you really need to base yourself in Dorset for a few days to appreciate all the wonderful gardens in the area. 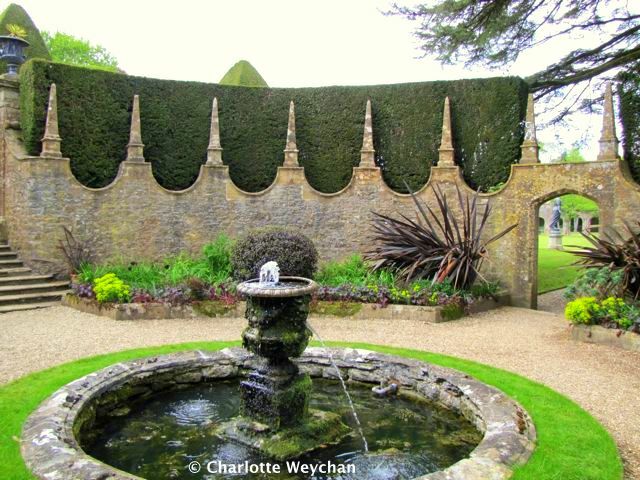 The Corona Garden (above) is just one of the fine features here, with its circular walls topped with obelisks, accentuated by the dark, clipped yew hedges. There's also a magnificent Great Court with pavilions, a White Garden and wonderful roses. 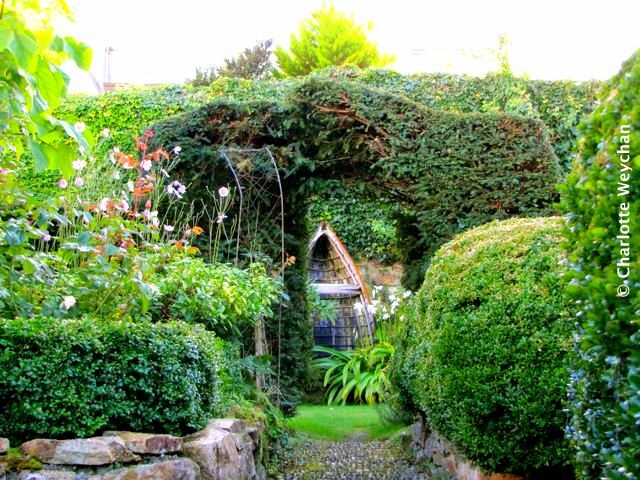 And at the other end of the scale, the charming small garden at the Abbey Hotel in Penzance - created by former British super model, Jean Shrimpton. You can't get much further west than this, but it's a wonderful place to base yourself to visit all the astounding gardens in the area, particularly in springtime when the Cornish gardens are filled to bursting with magnolias. Lovely views over the harbour and a peaceful haven in the middle of the town. I only stayed for three days, but could have stayed at least a week! Despite years of living in Dorset, I still haven't visited Athelhampton! Topiary - generally not a fan but the cones in the top one are rather fun in that context. What on earth is supposed to be happening in the Ascot example? Topiary to look as if piles of old green tyres are about to topple over. Hm. Interesting concept. This post makes me wonder if there are any gardens created specifically for winter. P.S. I'm also wondering . . . if Jean Shrimpton can move from Supermodeling to Gardening does it work the other way? Can gardeners plan to move from digging their plots to strutting the catwalks? There's hope yet! Thank you for sharing these lovely gardens. You have been blessed to be able to visit all of these beautiful gardens, and we are blessed by your sharing them in pictures and words. Charlotte, When you posted the picture you've used in your header previously it took my breath away. Upon opening your blog today, it did so again. I absolutely love that shot! You are a blessed woman to travel and see the world as you do! It's been such a joy to follow along with your garden visit posts ... I've put quite a few on my 'Dream Trip List' including Aberglasney and Athelhampton. I'll be looking forward to your next round of garden visits. What inspiration! It's good to look at these sun-filled gardens as the wind and rain dash against the windows! Thank you so much for taking us along with you to these beautiful gardens... and if you ever get the urge to visit gardens all year round come downunder to Oz. What a wonderful place to visit. In the third photo, the shrubs are trained like corkscrews. I have never seen that before. I am guessing that they have much more I have never seen. What a remarkable place. Wow! such a gorgeous place. so manicured and unique. Thanks for the tour and the introduction to your blog. I am following you back. Magnificent water fountain, a three-decker with a fairy... how wonderful. 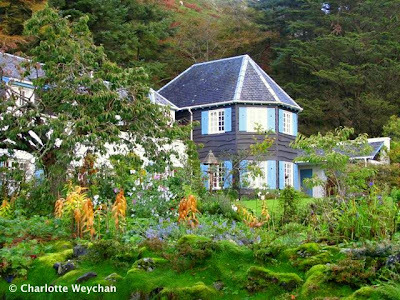 I love the theme of your blog and look forward to visiting my gardens as you travel.